Submitted by dennis on Monday, October 9, 2006 - 6:48pm. The Prado is a beautiful and breathtaking restaurant that is located at the heart of Balboa Park. Lynn placed a reservation for this restaurant at San Diego Restaurants.com with a comment that it was a birthday dinner occassion. We were seated in the semi-private section of the restaurant as specified in our reservation and we were promptly greeted by our gracious waiter and served with a basket of thin baked bread and hummus. We were not sure on what to order for dinner and so our waiter gave us his recommendations in which he explained down to the detail of how it was prepared and what ingredients it was comprised of. I was so impressed that I went with his recommendation of the Beef Short Ribs and Lynn decided on the Mahi Mahi. We also ordered two cocktails to try out (not shown). I had the Mango Martini (7.25) served with an actual slice of mango in it and Lynn had the Blood Orange Cosmo (6.95). We both agreed that the Mango Martini was probably the best martini we’ve had in a while. We haven’t even seen any other restaurant with that on the menu and the cocktail wasn’t overpriced like other upscale restaurants. 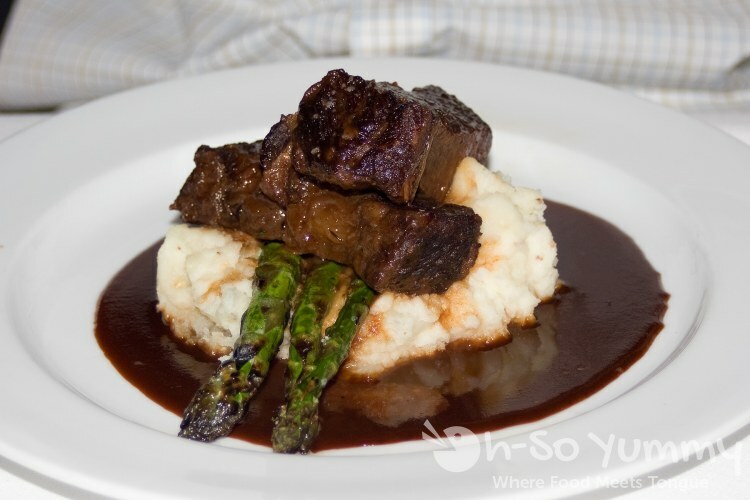 I ordered the Beef Short Ribs (23.95) which was served with mash potatos and asparagus with a non-sweet chocolate sauce poured around. OMG! This is possiby the softest and tastiest beef short ribs I have ever tasted. It was so soft that I did not even need to use a knife to cut through it. Instead, I used my fork and sliced through the meat. And the mash potatos with chocolate sauce was quite intriguing. It was one of the reasons why I choose this entree because I was curious on how well they went together. And it was not a disappointment. 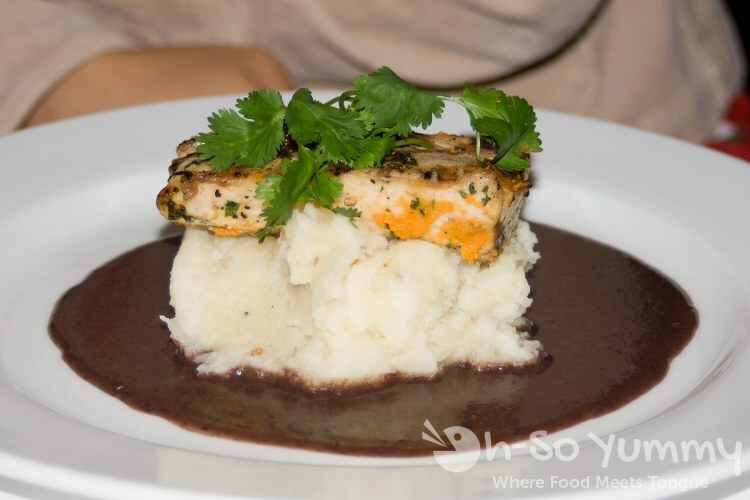 Lynn ordered the Mahi Mahi (19.95) which was also served over mash potatos and a chocolate sauce. It comes with a salsa mix (not shown) that was on a small bowl to the side. She requested that that salsa be served on the side because she does not like spicy foods or spicy ingredients. 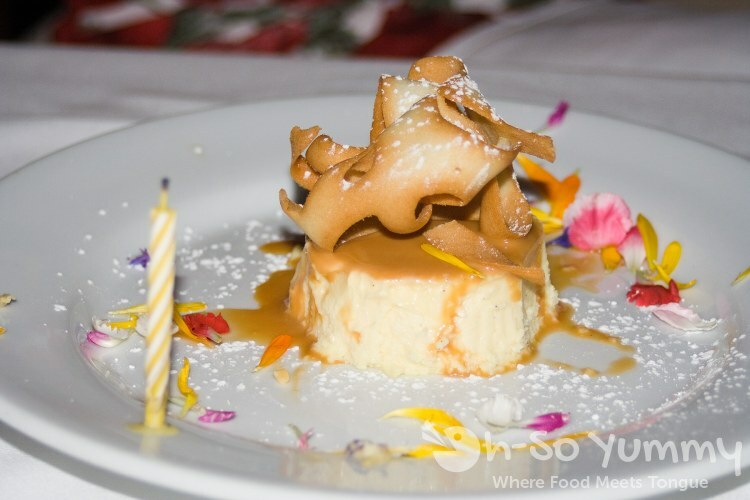 After our dinner, the waiter brought out a complimentary dessert of Flan Cheesecake for my birthday! It was a surprise to both Lynn and I and it was goood. I don’t even think cheesecake is that great but I loved this dessert. It wasn’t too overpowering in sweetness like most other desserts are.